I recently switched from vegan antiperspirant to vegan deodorant since becoming pregnant, and I’ve finally found my favorite product – Meow Meow Tweet deodorant cream. Not only does their deodorant cream work well, but it comes in sustainable packaging, it’s baking soda-free and clay-free in case you have those sensitivities, and they’re a vegan brand! This post contains affiliate links but it is an honest and personal review. I’ve always been skeptical of deodorants – they just don’t work as well as anti-perspirant. But, they also don’t have as many sketchy ingredients like aluminum, and I’m trying to put less weird stuff in my body now. I tried a few other vegan deodorants before discovering Meow Meow Tweet. These others stained my clothing, didn’t work well, and on top of that, came in plastic packaging. I wanted to mention the great packaging first because it’s part of how I came cross this deodorant. 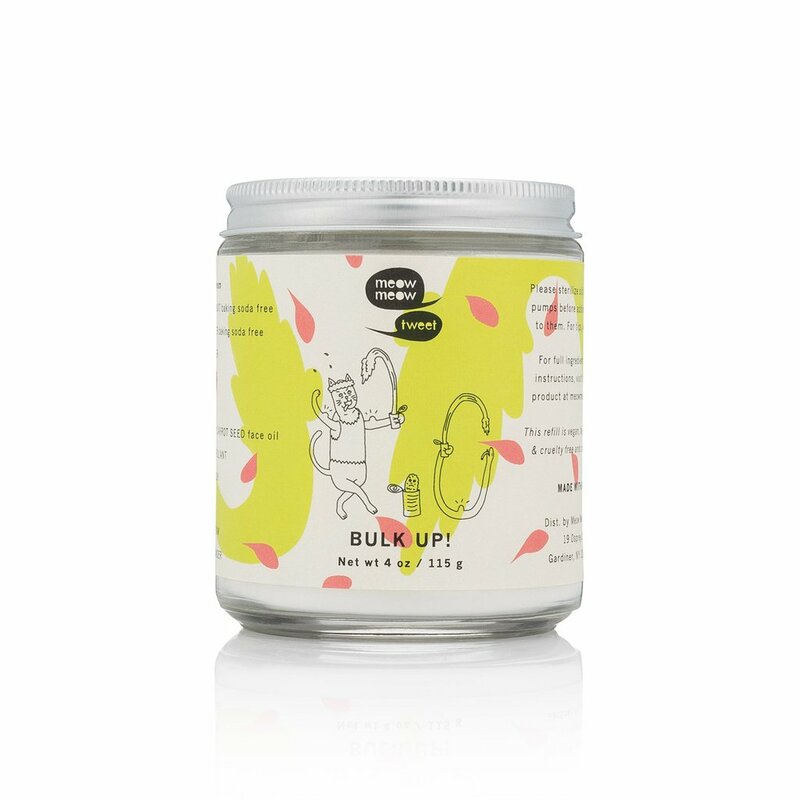 I was aware of Meow Meow Tweet – they’re included in our directory of vegan brands – but I had never seen their products in person until a recent Sustain LA event. Sustain LA holds pop-ups where you can bring your own or buy refillable containers, and fill them with vegan toiletries and cleaning products sold by weight. To add to the awesomeness of the event, they hold it once a month in Moo Shoes – an amazing vegan shoe store – as well as other locations throughout Los Angeles. 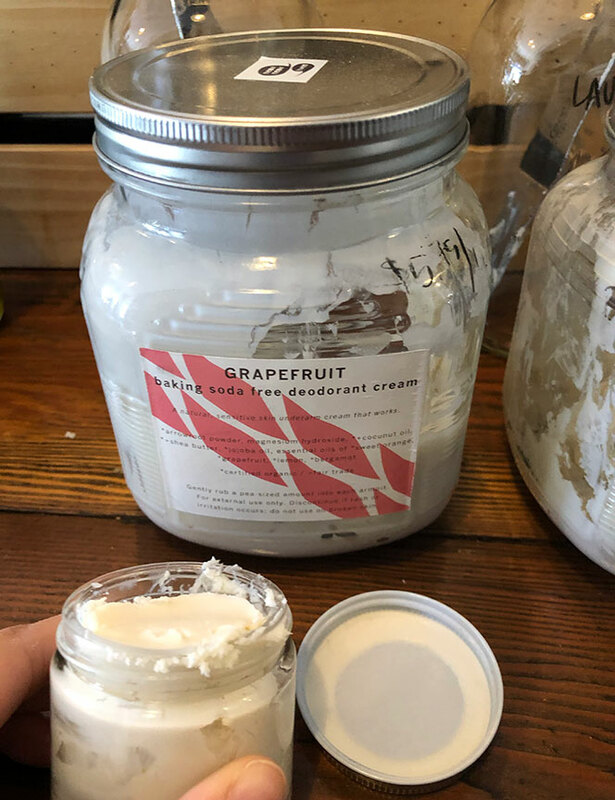 Sustain LA always has two giant glass jars of Meow Meow Tweet deodorant cream – grapefruit, and lavender. I filled a tiny glass jar with a few dabs of grapefruit to try, and I’ve now been back twice to refill! 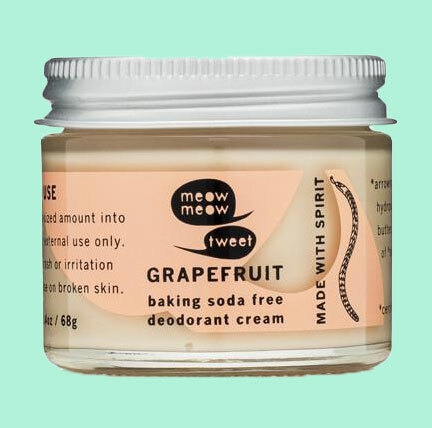 But, if you don’t have access to a refill event, you can order directly from Meow Meow Tweet – the deodorant comes in reusable glass jars either way. You can even order the giant jar directly from them and split it up with your friends and family or maybe even hold your own refill event! Meow Meow Tweet’s deodorant cream is like a thick, creamy lotion. The instructions say to rub a pea-sized amount into each armpit. I find that applying deodorant this way – like a lotion – is better at preventing clothing stains because you have more control over rubbing it in all the way. It rubs in better than a stick because the product itself is soft and smooth. I also like that it’s something that I feel safe about getting on my hands, unlike anti-perspirant. Now, this IS a deodorant, not an anti-perspirant, so I find it’s only effective for one day. That’s the trade-off of using any deodorant. Meow Meow Tweet deodorant cream uses mostly certified organic as well as some fair-trade ingredients. Their deodorant creams are free of baking soda and clay – both of which can cause skin irritation. The main ingredients are arrow root powder and dietary magnesium. I love the smell of both the grapefruit and the lavender. The fragrances are pleasantly natural and not too strong. The grapefruit deodorant includes certified organic grapefruit peel extract, and the lavender has certified organic lavender oil. Thanks for reading this review of a great vegan brand and product! You can find the deodorant here on the Meow Meow Tweet website. Do you have a favorite vegan deodorant? If so, let us know in the comments. Copyrights © 2015 - 2019 DOUBLECHECKVEGAN. All Rights Reserved.